WORCESTER, Mass. 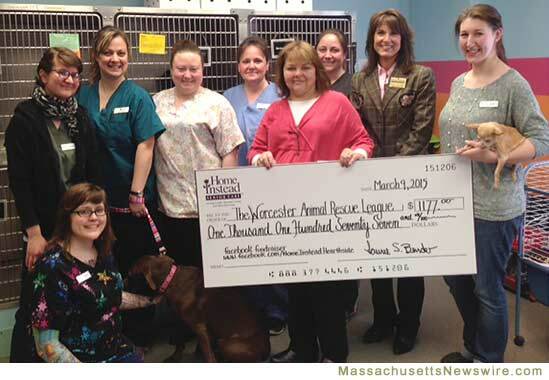 /Massachusetts Newswire/ — The Worcester Animal Rescue League today announced that a February fundraiser brought needed support to their efforts in rescuing at-risk pets and animals. For the month of February, Home Instead ran a fundraiser that encouraged readers to “Like” their Facebook page and in turn, Home Instead would donate to the Worcester Animal Rescue League. Home Instead Senior Care, a leader in the Home Care industry, is a private-pay agency that has been serving the Worcester County and Metro West areas since 1997. Because of their commitment to the community and the residents they serve, Home Instead chooses several non-profit organizations each year to run a Facebook Fundraiser. Home Instead Senior Care caregivers will go into a senior’s home providing companionship and support in all types of household chores and activities of daily living allowing them to safely stay in their home and remain independent.